It isn't all doom and gloom in the retailing world. These stocks are likely to pay shareholders heftier dividends next year. Investors are stepping away from many retail stocks lately as weak results, especially from department store chains, suggest the industry could be heading into an e-commerce-fueled slump. The declining share prices that go along with that falling confidence is pushing yields higher, but there are much better ways for income investors to achieve dividend growth. Below, we'll take a look at three retailers, Home Depot (NYSE:HD), GameStop (NYSE:GME), and Costco (NASDAQ:COST), who are posting improving results and seem poised to significantly boost their dividends. Home improvement is arguably the best sector within the retailing world right now, and Home Depot is, without question, the leader in that space. The retailer just posted its fifth straight estimate-thumping quarter of sales and profit growth: Earnings spiked higher by 19% as customers continued to flood its aisles. 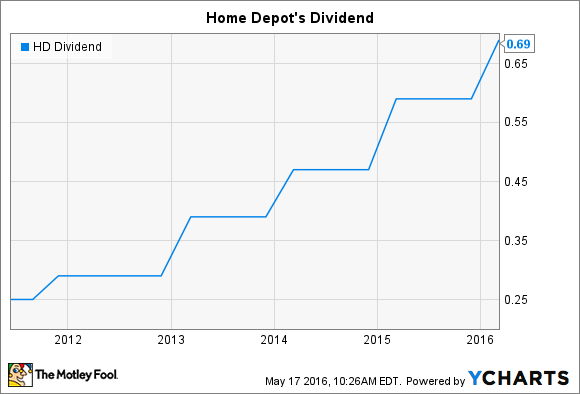 Home Depot's dividend has tripled over the last five years as net income has nearly doubled. HD Dividend data by YCharts. The good news for income investors is that Home Depot's dividend is more or less directly tied to its earnings growth. Management targets delivering 50% of profits to shareholders as dividends. And, since earnings are growing at a faster pace than even executives had forecast, that points to good news ahead for this payout. Home Depot is likely to announce another double-digit dividend hike when it posts its final 2015 quarterly results, typically in February. GameStop's core business, hawking new and previously owned video games, is under threat as digital downloading grows in popularity. Yet the specialty retailer has been preparing for that challenge for years, which is why management is aggressively pushing into new revenue lines like consumer electronics, mobile phone services, and gaming collectables. CEO Paul Raines targets generating more than half of all earnings from sources other than disc-based video game sales by 2019. The portfolio shift has made GameStop more profitable, not less, even as the video game business begins to weaken. Net income was a record $400 million last year, and executives project as much as $423 million in fiscal 2016 along with a slight drop in comparable-store sales. With earnings approaching $4 per share, the company should have no problem boosting a $1.44 per share payout that currently works out to a better than 5% yield. Profits by fiscal year. Image source: Costco financial filings. Sure, the company has other good uses for its cash pile, including a planned 25% boost in capital expenditures. And profit growth has slowed down recently. The company in March posted its second consecutive quarter of declining earnings as its comparable-store sales gains decelerated. Customer traffic growth was 3.5% last quarter, marking a slight decrease from the 4% growth it has seen over much of the last six years. However, membership fees, which are Costco's real profit drivers, are as strong as ever. The renewal rate is bumping along near record highs of 91% even as its subscriber base grows. Costco's dividend strategy is unusual because of its reliance on unpredictable, but huge, special dividends lately as opposed to a steadily growing payout commitment. But whether it comes in another surprise lump payment or a raise that brings its yield further above 1%, it's likely that Costco will be sending shareholders more dividend cash in the years ahead.